Saturday is a day I would normally like to cook something more elaborate but becoz I have to cook something more elaborate for pot bless after Sunday service, I opted for something easy for my Saturday night so that I don't tired myself out. You know to feed a crowd of 60 people can be quite a heavy task even though it is just a dish from me.....but imagine I get to taste at least 25 dishes....so another reason for not eating a heavy meal yesterday. Have to keep some space for tonight's pot bless :) Coming back to this dish...it is a simple spaghetti dish with ingredients consisting of cherry tomato, garlic, black pepper , sea salt and green capsicum sauteed in olive oil . 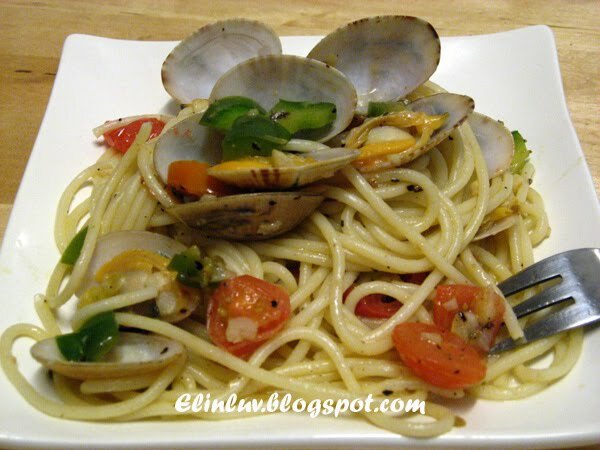 Mixed in the steamed ocean clams and cooked spaghetti and tada...you get a yummilicious plate of ocean fresh clams spaghetti ! serve it piping hot....delish ! Cooked spaghetti till al dente . Drained and leave aside. Meanwhile steamed the clams with salt and chinese cooking wine for 6 minutes in hot boiling steamer. Off the heat. In a non stick pan , heat up olive oil and saute garlic, black pepper , capsicum and cherry tomato till fragrant but make sure the veggies are not over cooked. 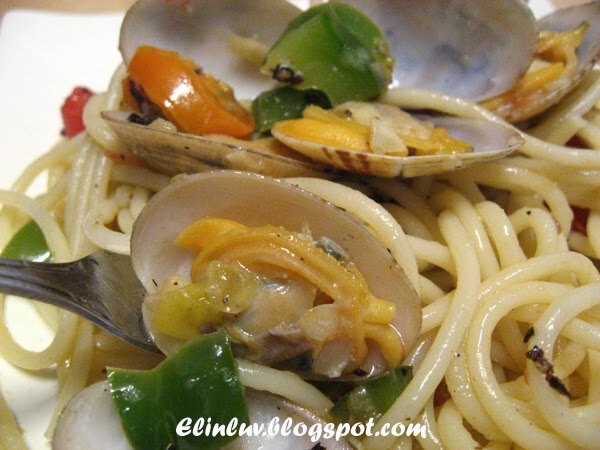 Off the heat , add in the steamed clams and the wine gravy and the cooked spaghetti and stir till well mixed. Serve hot . Enjoy and have a great Sunday ! I love this too... wonderful dish..
Gosh! Looks like high class restaurant one. real pro lah you Elin!!! 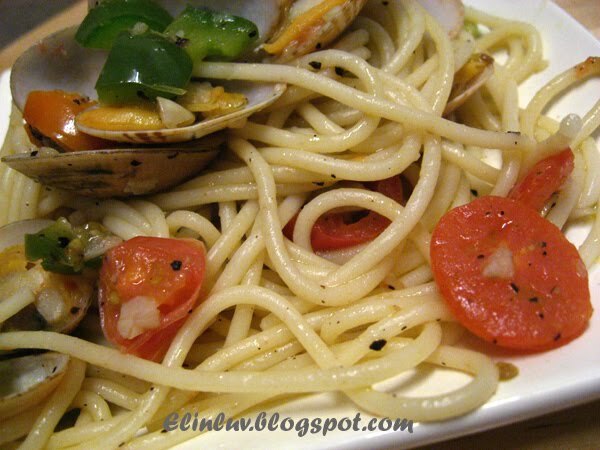 A great pasta dish! 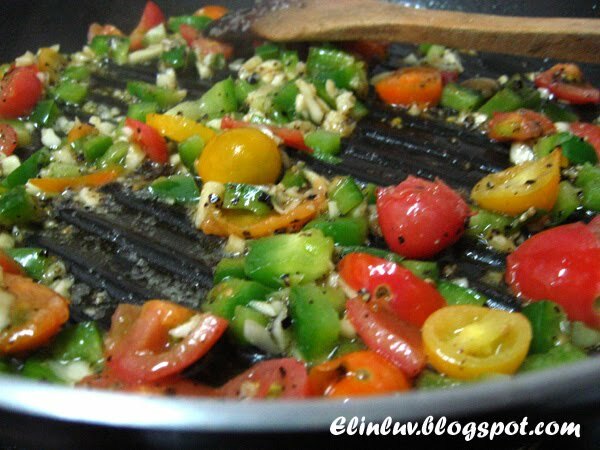 I love lots of garlic and fresh grape tomatoes in my pasta too! 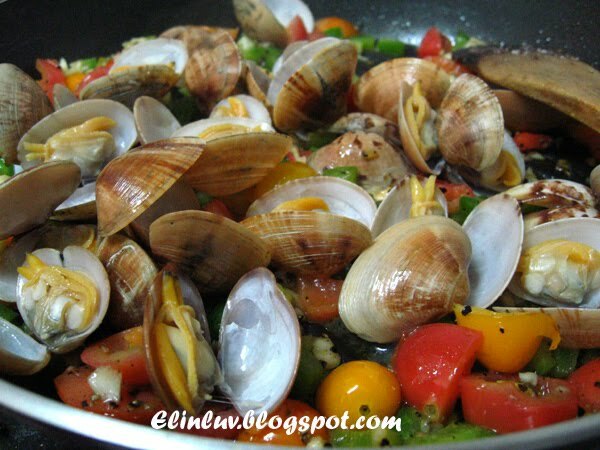 Fresh clams! Oh, that looks sooooooo good and fresh and can almost taste that spaghetti. 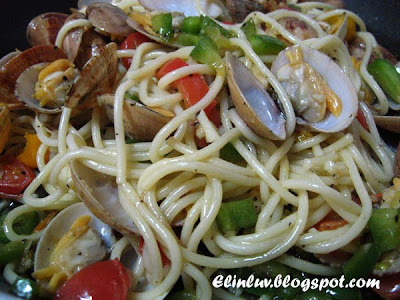 Gimme the steam clams anytime..but without the spaghetti :p.
I love this ! my kinda fresh and lite pasta dish...and lately I've been craving clam! shrimp! 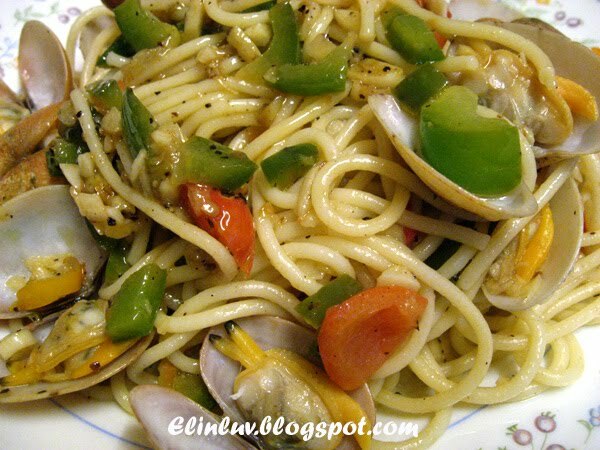 and more clams! Yeah, all the lovely ingredients that I would love in spaghetti. This looks better than the one that I ate at the Italian restaurant. 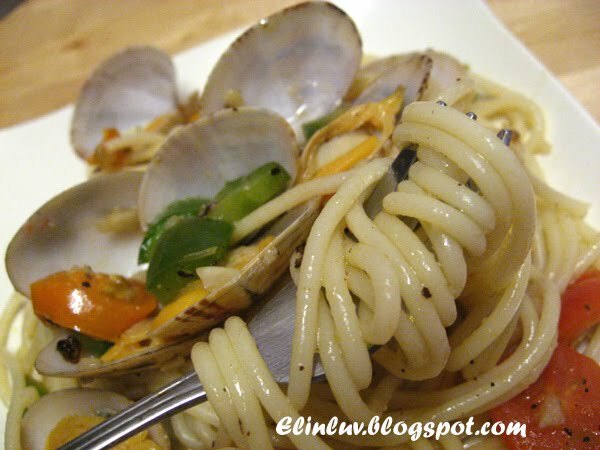 I love the freshness of this pasta dish! Lovely recipe, Elin.